Da Capo Press, 9780306820434, 336pp. In July 1944, thirty-two-year-old Swedish diplomat Raoul Wallenberg arrived in Budapest on a mission to rescue the last Jews of Europe.Over the next six months, he repeatedly risked his life to save tens of thousands of Jews, defying mass murderer Adolf Eichmann and crazed Hungarian fascists while enduring one of the bloodiest sieges of World War II. Tragically, when Budapest was finally liberated, the Holocaust’s greatest hero had disappeared into the Soviet gulag; to this day, his exact fate is unknown. 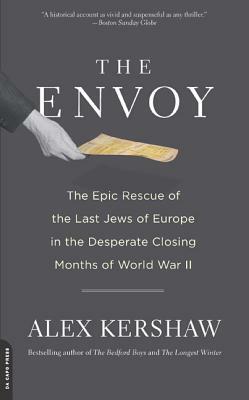 Alex Kershaw is the author of seven books, including the widely acclaimed bestsellers The Bedford Boys, The Longest Winter, The Few, and Escape from the Deep. He lives in Massachusetts.